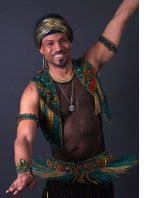 From noon to 2 p.m. Tarik will be teaching Afrobeat Bellydance, a fabulous choreography that combines elements of Egyptian, Congolese, and Caribbean movements to create a hot and spicy gumbo full of excitement and the celebration of life! Tarik's workshop will be followed by our annual Fall Fantasia hafla - a Paradise-themed party and the perfect antidote to a cold November day! Join us for an afternoon and evening of fabulous Dance fun! The Fall Fantasia hafla will feature dance troupes and soloists, delicious refreshments (including those fabulous empanadas by Almas and beverages & desserts courtesy of the Ladies Auxiliary!) Enjoy the dancing and shopping with your favorite bellydance vendors! Want to be a part of this exciting show? PM Farasha (Marisa Pierson) now to hold your dance spot!